Anonymous Shirdi Sai Devotee from India says: Om Sai Ram. I want to share a beautiful leela of Our Sai Maa. I am still getting goosebumps as last Sunday (8-7-18) two things happened with me. First thing is, I got a call from an elderly man, from Sai Bandhan whatsapp group telling, "Do not worry, Baba will do all good". I don't know his name, nothing, as I haven't mentioned or shared any problems or anything with him. But still he had pinged me and was giving blessing and good wishes. The second thing is, Immediately after that, one of my Sai sister called me from Shirdi and told me "Baba wants to meet you". Saying so she took her camera phone in Maruti Mandir and in Dwarkamai. I was so spellbound and had no words to describe my feelings. 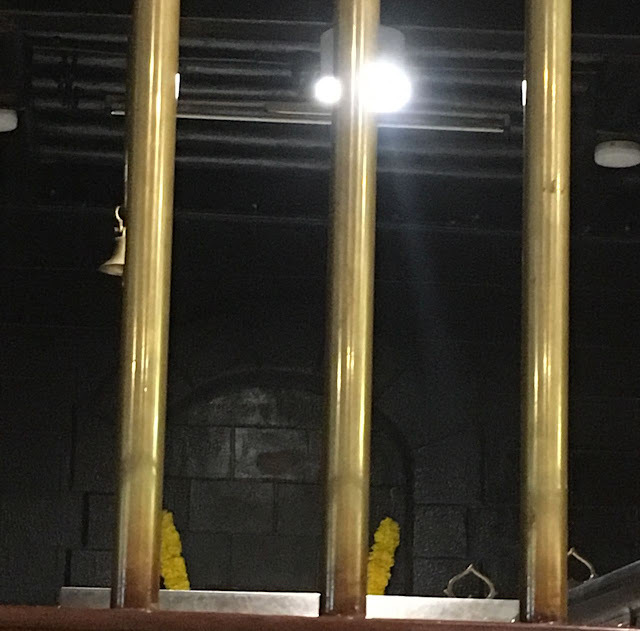 Although I was worried as phone was not allowed, but she told me "When Baba wants to meet you then why are you so worried, have darshan and don't worry". I felt so blessed and did whole Parikrama of Baba's Dwarkamai and Maruti Mandir. The strange thing is that, we don't talk so frequently and I didn't ask anything as such, she herself told me to have darshan. I never thought in my dream also that Baba will be Live through Dwarkamai on that day and will give me darshan. At that time I was preparing Jawahar Roti. Usually I don't prepare it, but that day I don't know I somehow felt like preparing it for Baba and I offered it to Him. Felt like He was hungry for love and roti too. Then next day, Monday (i.e on 9-7-18) when one of the devotee in our BMP Khichadi group had shared this picture saying that, "Baba has appeared in Dwarkamai the last night" i.e on Sunday 8-7-17 (I have uploaded the picture). I was so happy seeing it and it was Baba Who gave me a confirmation again that it was Baba's wish that He gave me Darshan of Dwarkamai on Sunday and its He only Who came at my home and gave me His Darshan. So it's a request to all Sai Children, don't lose hope Baba is listening to everyone and He is listening even our silent prayers also. Loads of love to Baba, for Him nothing is impossible. Baba’s ways are beyond our intellect. When He wants to meet someone He pulls His sparrows to Shirdi in His unfathomable ways. Your experience reminds me of Khushalchand whom He pulled through the dream and sending the Tonga (Ch -30). In your case He pulled you through the latest technology by sending your friend with phone in Dwarkamaai which can happen only if He wills. None can be like You Deva - The Greatest Saviour ever. Love You Deva. Jai Jai Ho Sai...!